Developing the skill of self-monitoring plays an important role in English Language Learners’ abilities to improve their pronunciation. As students practice a particular pronunciation skill, you can choose applicable questions or prompts to teach your students to self-monitor. With consistent, guided, and explicit instruction and practice, students will learn to self-monitor on their own. 1) Self-monitoring prompts based on one’s pronunciation of sounds already learned. 2) Self-monitoring prompts based on one’s realization of sounds not learned. to say and what one can say. format or in an open-ended format, depending on your students’ needs and abilities. Are you satisfied with your pronunciation of the words? Why or why not? Which sounds can you pronounce well? Which sounds do you not pronounce well? Which sounds are easy for you to say? Which sounds are difficult for you to say? Can you hear the difference between short and long vowels? Which ones are difficult for you to distinguish between? 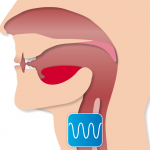 Can you hear the difference between voiced and voiceless consonants? Which ones are difficult for you to distinguish between? Record saying the word using a recording function on the computer. Then listen to the narrator on the computer, or repeat after your instructor. Do you hear differences between your pronunciation and the pronunciation of the narrator/your teacher? For a free tool to use with self-monitoring, see my blog post here, or preview the tool here.